James 1 [13.] Let no man say when he is tempted, “I am tempted by God,” for God can’t be tempted by evil, and he himself tempts no one. But each one is tempted when he is drawn away by his own lust, and enticed. Then the lust, when it has conceived, bears sin; and the sin, when it is full grown, produces death. Don’t be deceived, my beloved brothers. Every good gift and every perfect gift is from above, coming down from the Father of lights, with whom can be no variation, nor turning shadow. 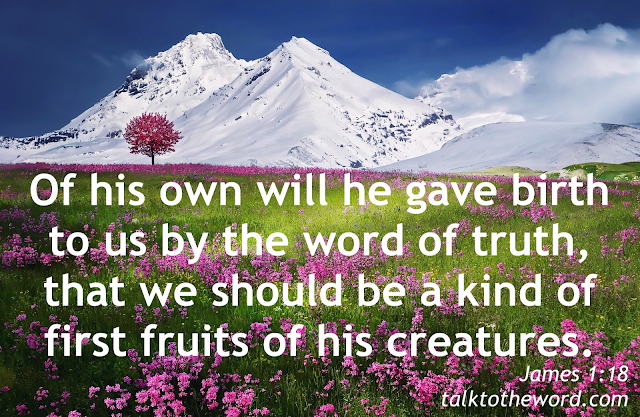 Of his own will he gave birth to us by the word of truth, that we should be a kind of first fruits of his creatures. James 1 [19.] So, then, my beloved brothers, let every man be swift to hear, slow to speak, and slow to anger; for the anger of man doesn’t produce the righteousness of God.